Who would have thought that I would be sitting in a taxi in Georgia, listening to some old-school French rap with a young Russian couple, fearing for my life at every turn as our driver took over cars and trucks alike at full speed? I had arrived in the early morning at the Didube station in the outskirts of Tbilisi, hoping I could catch a local minivan known as a marshrutka to the mountain town of Kazbegi. The place was hectic, with loads of minivans already parked in between small shops selling everything from backpacks to freshly baked bread. I could hear voices announcing destinations but none mentioned the place I wanted to go. It turned out the marshrutka I was aiming for had just left a few minutes before, or so I was told. Therefore here I was, sitting in the back of a taxi with my seatbelt fastened tightly, silently praying to get to Kazbegi in one piece. We had already listened to a whole album of the Belgian singer Stromae, strongly requested by my fellow Russian travellers, when the taxi finally pulled over. As I stepped out of the car, I glanced at the Russian boy called Sasha and could read as much relief on his face as was on mine. Breathing some fresh air was long overdue. Ananuri, the place where we had stopped, seemed perfect for just that. It was hard to see past the thick wall that enclosed it so I followed the dozen visitors down to the entrance and discovered a castle. The first building that caught my eye was an ancient church, sitting at the core of the fortress. Behind it was a range of fortification walls and down below was a tower, topped by a cross, looking down the valley and the river at its feet. Sun was high up in the sky, rendering the landscape bright and eerie. Time was ticking though and I got back to the car, casting one last look at the inscriptions written in Georgian alphabet on the walls that looked to me like elvish. Watching the landscape unfold through the window helped me focus on the journey rather than on the fast and furious vibes of the taxi. It was getting more beautiful at every turn as we got closer and closer to the Caucasus Mountains. The driver seemed to be on the same page and pulled over once more for us to take pictures. Of course, he had chosen the single most touristy place in a ten-miles radius, where stall vendors were offering homemade jams and honey. As I walked to a platform painted with some bright, Soviet-like historical characters, I had to admit the scenery was stunning. In a way and despite the tourists, the place felt genuine, perhaps only in an over the top way that I was not used to. Arriving in Kazbegi could not have felt more different. The sign saying Stepantsminda, which was the new post-USSR but frankly not quite used name of Kazbegi, welcomed me into a sleepy, secluded town. Nestled in between mountains, it could have looked like every other town but I looked up and my eyes widened when I saw what made it so special. A lone church was sitting on top of a hill, facing the snow-capped peak of Mount Kazbek. The whole purpose of my long, at times scary trip to northern Georgia was standing right there. The hike was daunting as much as it was fascinating. I could have started my exploration right away but the heavy backpack on my shoulders and my stomach growling brought me back to reality. After settling in my guest house, I stopped at the first restaurant I could find. The owners were playing cards and by the look on their faces, they could have done without me interrupting their game. A few minutes later, a freshly baked Adjarian khachapuri was brought to me nonetheless. High on proteins, or let’s be honest on calories, I was now ready to climb my way to the Gergeti Trinity Church. 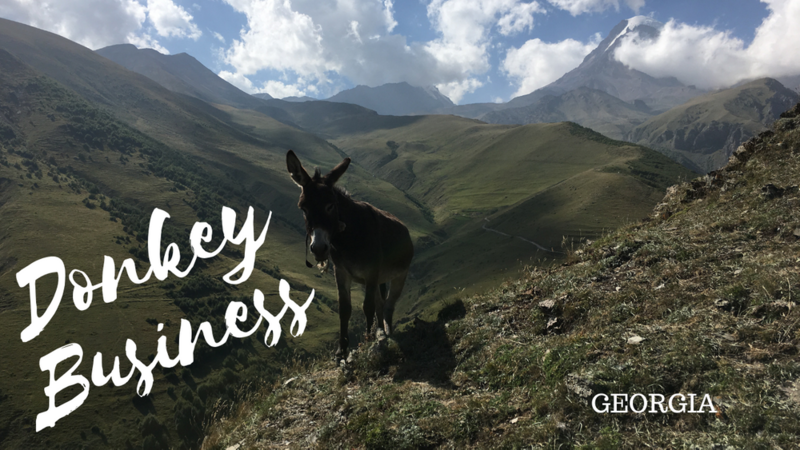 The first step was to walk through the town as well as the village of Gergeti itself until reaching a parking lot where one of the paths leading to the church began. All pumped up, I walked towards my purpose with confidence. The first steps were fine. Then, the path got as steep as I was sweaty, as slippery as I was out of breath. Luckily, the ruined brick tower dominating the mountains in the background or the river down below where wild cattle came to quench their thirst, were just some of the reasons why I could stop and pretend I was taking pictures when I was only struggling to control my heartbeat. Then a spire appeared, followed by the dark silhouette of a bell tower. In the distance, wild horses were grazing, watched over by the peak of Mount Kazbek playing hide and seek with cotton-like clouds. I strayed from the path, escaping the loud voices of tourists conversing in Russian or English, passing them by at full speed. Two donkeys met me halfway, walking behind me as if pushing me back towards the church. The message was clear so I turned away and walked the few hundred meters leading me to Gergeti. The church was already packed with tourists, most of which had not hiked at all, as shown by the many taxis patiently waiting in the nearby parking lot. I had expected Gergeti to be peaceful and serene, it was noisy and crowded. Feeling a tad underwhelmed, I did not linger. Yet, as I sat on the grass below, the peace and quiet came back. Mount Kazbek was still shrouded in mystery and so was the church, from afar, where the silence would not be broken. The hike was still rewarding, through landscapes whose magic could barely be described. Many clouds flew past Mount Kazbek, many tourists flocked the Gergeti Church, before I finally stood up, ready to leave. Searching for a different way down, I spotted a narrow path going through the woods, on the other side of the church. It looked steep but walkable so I tried to secure a sure footing, which turned into an epic fail as I fell down on my bottom instantly. Nobody had seen me fall but a donkey, standing still on the opposite side and staring in my direction, keeping a watchful eye on me. On the way down, there were so many times I almost tripped and twisted my ankles or worse that it crossed my mind I really could have used a donkey. Too bad they weren’t following me anymore.